Powers/Abilities: Thor Girl possesses the conventional physical attributes of the Asgardian gods. She is immune to all Earthly diseases and is resistant to conventional injury. If she were somehow wounded, her godly life force would enable her to recover with superhuman speed. It would take an injury of such magnitude that it dispersed a major portion of her bodily molecules to cause her a physical death. Even then, it might be possible for a god of significant power, such as Odin or for a number of Asgardian gods of equal power working together to revive her. Thor Girl also possesses superhuman strength (Class 85 perhaps) and her now Asgardian-level metabolism provides her with far greater than human endurance in all physical activities. (Asgardian flesh and bone is about three times as dense as similar human tissue, contributing to the superhuman strength and weight of the Asgardians.) She basically has all the power, strength and speed of Thor, but it remains to be seen if she has the longevity or long life span of the Asgardian gods. 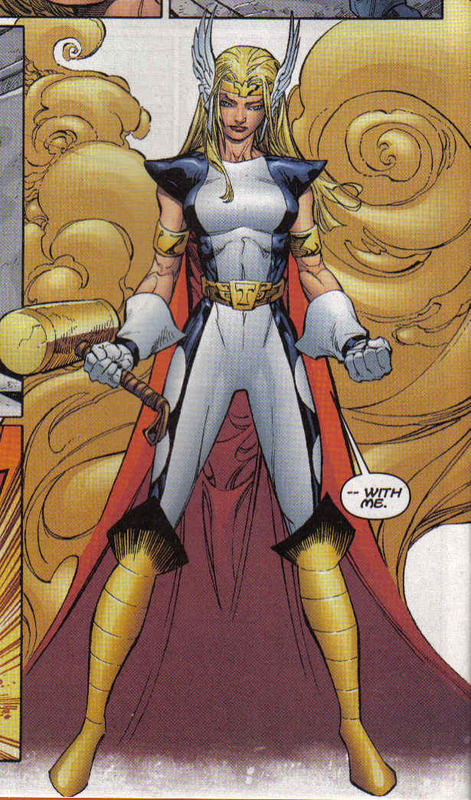 As Thor Girl, Tarene wields a gold hammer through which she could channel her personal cosmic powers as a continuous beam of energy capable of knocking Thor off his feet and shattering buildings. Compared as a rival to the Odin-power, she can also alter her outward attire from her Asgardian arraignment to civilian attire. She can also traverse dimensional barriers such as from Earth to Asgard. She also has cosmic senses to perceive the true natures of other beings. However, much of this power was lost with Odin's demise and now Tarene has about the same level of power as a typical Asgardian goddess. She can fly and create storms. As a mortal high school student, she seems to be gifted mind or have a high capacity for learning, carrying a perfect 4.0 grade average. Unusual Physical Characteristics: As Thor Girl, Tarene speaks with more Asgardian linguistic personality characteristics ("godly"), but as herself, she responds and communicates with normal fundamental diction. History: (Official Handbook of the Marvel Universe: Women of Marvel 2005, Thor II#23 (fb)) - Tarene is the inhabitant of an unidentified extra-terrestrial race in the galaxy which has gone several millennia without being discovered or contacted by outside alien races. Her planet had been prophesied years ago by an alien sorcerer named X'Hoss to be the location of the birthplace of the Designate, who was destined to elevate all life to greatness. X'Hoss created three artifacts, the Illumination Stone, the Map of All-Ending and the Chalice of Ruins to guide future generations in preparation for the Designate. Like her fellow citizens, Tarene studied to aide the unknown future Designate unaware that she was destined to be the Designate herself. (Thor II#22, Thor II#23-24 (fb)) - Thanos of the Eternals stole and used the Map of All-Ending to lead the way to Tarene's planet, exterminating all her people in the process. Stopping short of killing Tarene herself, Thanos abducted her knowing her tears within the Chalice of Ruins would unleash a wave of destruction through the universe. Thor, Firelord and the Recorder came to rescue her, but they were all easily overpowered by Mangog working for Thanos. Upon seeing Thor beaten into submission, Tarene shed tears to fill the chalice. Drinking from the chalice, Thanos was filled with enough cosmic energy to bring death to the cosmos and departed with Mangog and Tarene in tow. (Thor II#24) - Cast aside by Thanos, Tarene watched as Thor once again unleashed his might against Mangog and confronted Thanos. Protected by weapons forged by the Odin-power, Thor crushed the Illumination Stone. Without it, Thanos lost control of the energies he had absorbed and was consumed by their energies. (Thor II#34 (fb) - BTS) - Thor left Tarene to the tutelage of the Recorder and Tana Nile of the Rigellian Homeworld, but she felt stifled and held back by their rigid lessons. Inspired by the adventure and experience she had with Thor against Thanos, she transformed herself into a superhuman being equal to the Asgardian gods by using Thor as a template. 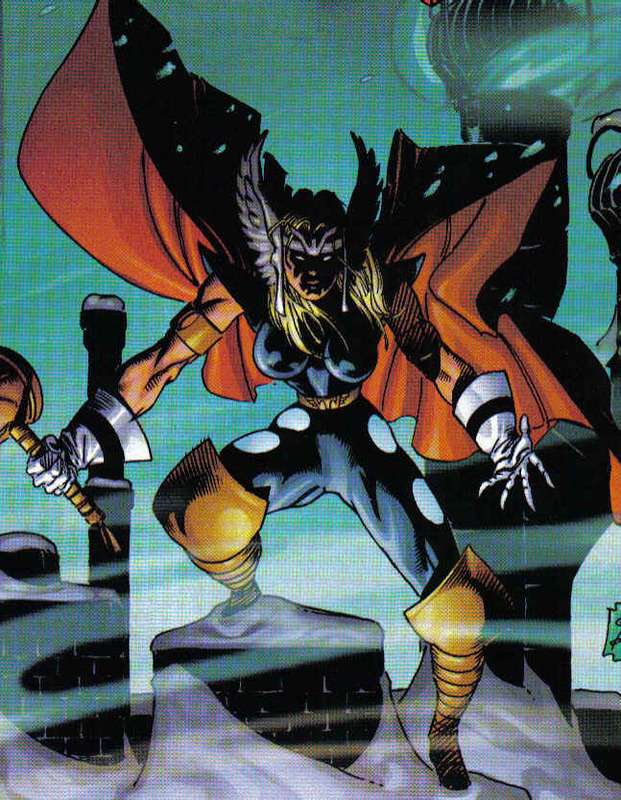 Creating a hammer equal or close to Mjolnir, she departed Rigel to seek out Thor on Earth. (Thor II#33) - Thor Girl came to Earth seeking Thor and subsequently found him in battle with Nullitor, an immense robot sent against him by Artur Zarrko, The Tomorrow Man, in liege with Gladiator of the Shiar Imperial Guard. Wielding her hammer, she joined Thor in bringing down Nullitor. (Thor II#34) - Realizing Tarene's importance to the future of the universe, Thor gently protested her ambivalent eagerness to experience life by his side, but she continued to use him as an example by comparing his desire to depart Asgard to her desire to live among mortals on Earth. When she revealed the scope of her power to reveal her worthiness to Thor, she attracted the attention of Gladiator looking for Thor. As Jake Olson, Thor introduced Tarene as his cousin Tara Olson to his colleagues in his personal life. (Thor II#35) - As Thor Girl, Tarene went to Thor's assistance against Gladiator. In his powerless guise as Jake Olson, Thor was struck unconscious, and Thor Girl continued to hold Gladiator at bay long enough that the Enchantress, her identity concealed behind that of Jake's partner, Christine Collins, could revive Thor with Mjolnir. Although briefly detained, Thor Girl managed to catch up with Thor and blast Gladiator with a near fatal jolt. Odin, Chieftain of the Asgardian Gods, then arrived in the company of the goddess Sif upset that Thor was not by his side in a time of need to Asgard. Finding Thor interested in the welfare of mortals, he bound Thor behind his mortal facade of Jake Olson. While bereft of his godhood, Thor succumbed to all the injuries he had received from Gladiator. (Thor II#36-38) - Thor Girl charged into Asgard demanding Odin restore Thor's godhood. Odin refused her request saying only that Thor was required to earn his godhood back. Returning to Earth, her spirit and power was siphoned from her body by Loki and used to fuel the Destroyer against Thor in his powerless and weakened condition. Responsible for binding Thor to his human form, Marnot appeared and separated Thor from Olson and warned him that Tarene was trapped within Destroyer. As her body was held captive by Loki and Karnilla, Thor Girl tried to break Loki's hold on her even as the Destroyer beat Thor with Mjolnir itself. The Enchantress, meanwhile, stole Thor Girl's hammer long enough for Thor to use it against Tarene and hold her long enough for Odin to undo Loki's spell's. Reunited with her body, Thor Girl departed Loki's presence. (Thor II#39) - As Tara Olson, Tarene was introduced to Jake's mother, who had no memories or knowledge of her. Odin meanwhile saw Thor Girl as Thor's successor on earth and fully split Thor from Jake Olson, making them separate individuals, so that Thor could live up to his duties on Asgard without returning to defending Earth. (Thor II#40) - Tarene was urged by Jake to join Thor and the Asgardians in battle against Surtur in Norway. Reminded of her duty as the Designate to never ignore the plight of others, Thor Girl returned to Asgard to free Thor as he underwent treatment for his injuries and accompanied him to Norway against Surtur. Opening her full power against Surtur, Thor Girl took a blow from Surtur, but Odin usurped her energies and carried them against Surtur himself, annihilating both himself and his opponent in a massive explosion over the Norwegian landscape. (Thor II#41) - Thor Girl was implored by Thor to use her power as the Designate to revive Odin, but in trying to do so, she collapsed. Although Thor called upon Asgardian medics to restore her strength, Thor Girl quickly realized that she was bereft of her full powers and accompanied Thor and the Asgardians carrying Odin's ruined body back to Asgard. (Thor II#43) - Thor Girl used excessive force to rescue Dale Krogstad, a tourist to New York, from getting run over by a taxi cab and was forced to realize her naive awareness of the mortal world and inexperience against a Cypher demon masquerading as the Skurge the Executioner. Now in control of the Odin-Power, Thor stripped the Cypher of its guise and sent it back to Hela, the death-goddess. (Thor II#46-50) - While destroying probes sent to rob a bank, Thor Girl unwittingly endangers the people around her, and Jake tries to give her guidance. However, running afoul of the Grey Gargoyle, she is turned to stone and shattered with her own hammer. Discovering her stone components, Jake uses Amora's enchanted mirror to become Thor again, siphoning power from the real Thor who draws it back. Unable to become Thor, Jake tests the mirror's power to restore Thor Girl to full normalcy and succeeds. (Thor II#53) - Protecting the South American Rain Forest, Thor Girl buys off the workmen chopping down the tress with Asgardian gold, but she is attacked by Federal Agents trying to stave off the possible threat Thor imposes since replacing Odin and moving Asgard to Earth. (Thor II#61) - Volstagg was sent to Earth to further protect Tarene as Tara Olson, but all he does is warrant her more attention. As Tara, she confesses to her friend Amanda that the Asgardians truly are the former deities of the Scandinavian and German tribes of earth. When Jake Olson voices his opinion on how Thor is handling things, Tarene becomes Thor Girl in order to travel with Jake to Asgard and once more confront Thor about Asgard's presence on Earth. (Thor II#62) - As Tara Olson, Tarene was put on the spot by one of her teachers before her best friend, Amanda, because of her perfect grades. (Avengers: The Initiative#18 (fb) - BTS) - Thor Girl was kidnapped by the Skrulls. A duplicate of her went to Earth, joined the Initiative, and was assigned to the Georgia state team, the Cavalry. (Secret Invasion#8 - BTS) - Thor Girl returned to Earth, alongside several others who'd been kidnapped. (Avengers: The Initiative#20) - Thor Girl attended a meeting run by Alicia Masters (a former Skrull kidnap victim) and Leonard Samson, alongside the other former Skrull captives, meant to help them return to regular life. (Avengers: The Initiative#21) - Thor Girl scheduled a session with Trauma, the camp counselor, when she learned that her Skrull counterpart had been close to him. She was asking about the Skrull's deeds when a loud explosion racked the base. She rushed outside and saw a clone of Thor called Ragnarok attacking. She rushed at him, but soon found herself overpowered. She confessed that her power was weakened due to giving of it to Odin before he died. Just as Ragnarok was prepared to kill her, Gauntlet rushed in to battle. She soon saw Trauma shift into a version of Thor to try and stop Ragnarok, but he was unsuccessful. (Avengers: The Initiative#22) - After a massive battle, Ragnarok left Camp Hammond to find the true Thor. Thor Girl also left, after bidding farewell to Trauma (who was surprised she didn't offer romantic advances), determine to find Asgard herself. (Avengers: The Initiative#23) - Thor Girl helped with the cleanup in Camp Hammond after the battle with Ragnarok. (Fear Itself: Youth in Revolt#1) - When the Serpent (Cul) began his reign of terror on Earth, Steve Rogers commissioned Prodigy to reassemble the Initiative to handle the fear-induced rioting that was spreading across the country. The Cavalry, including Thor Girl, stopped a robbery at Al's Gun & Ammo Emporium in Atlanta. Ultragirl was surprised Thor Girl called the criminal a "knucklehead". They talked about Thor Girl staying on Earth permanently and Ultragirl promised she would always have her back. When Red Nine received a text from Prodigy he told his teammates that Prodigy wants to bring back the Initiative. Thor Girl was among the Initiative members who gathered in Washington DC to rejoin the Initiative. She later joined the Cavalry back in Atlanta to deal with rioters. The situation got out of hand when a policeman shot at Thor Girl because she was using an Asgardian hammer like the Worthy and the bullet ricocheted back at the policeman, killing him. (Fear Itself: Youth in Revolt#2 (fb) - BTS) - Prodigy called Thor Girl to a meeting in Virginia. (Fear Itself: Youth in Revolt#2) - Though Ultragirl tried to reassure Thor Girl that it was not her fault what had happened Thor Girl knew that it was her presence that caused the panic to escalate. People had died because of her and their teammates had been taken to a hospital. Thor Girl and Ultragirl arrived in Virginia and saw Prodigy with the press. Prodigy told Thor Girl to stay calm because an outburst would only worsen her situation. He told the press that after what had occurred, even though she was a hero, Thor Girl would turn herself in. She didn't resist her arrest. Detained in a cell built for super-powered beings Thor Girl was visited by two federal agents visited her to interrogate her about the weapons, armor and plans of the Worthy, who used Asgardian weapons. She couldn't tell them anything and asked to talk to them in person because she was not under arrest. Instead they tortured her with the energy-wielding systems of her cell for not cooperating with them. After enduring the torture for some time she was freed by her friend Cloud 9. (Fear Itself: Youth in Revolt#3) - The Liberteens failed to apprehend the escaped fugitive Thor Girl and her friend Cloud 9, who was wanted for questioning, in Philadelphia. Ms. America informed them that the duo just added to the chaos, but they still fled. They decided to find a place were they were needed. They later saw the TV signal getting cut off during a fight between the hammer-wielding Kuurth (Juggernaut/Cain Marko) and Hardball in Las Vegas. (Fear Itself: Youth in Revolt#4) - Thor Girl and Cloud 9 flew to Las Vegas. When they arrived Gravity and Hardball were fighting each other and she tried to stop them only to be knocked away by them. (Fear Itself: Youth in Revolt#5) - When the fight between Gravity and Hardball caused an earthquake Thor Girl and Cloud 9 worked together to save the people at the Heavy Hitters Hotel Casino. They saved nearly everyone, but got trapped under tons of rubble alongside the remaining civilians when the building collapsed. Though they survived because Thor Girl held up the rubble it was only a matter of time until Thor Girl was too exhausted to keep holding it up. Cloud 9 motivated her to find her inner strength and she freed them all from the rubble by tapping into her destined powers of the Designate. When she saw Prodigy she attacked him with her hammer for her imprisonment and the torture. (Fear Itself: Youth in Revolt#6) - After hitting Prodigy her Designate powers slowly and painfully awakened. Prodigy tried to subdue her alongside Debrii and Supermax, but she quickly convinced the latter two to back away. She then gave Prodigy a chance to explain himself because her friends Cloud 9 and Komodo asked her to. Even though she listened to him she realized that he was afraid of her becoming a monster merely because she was wielding a hammer as much as the others did. She dropped her hammer and welcomed her transformation into the Designate. Ultragirl and the other Initiative members attacked her because they believed her to have become a threat to everyone, but the newly-transformed Designate didn't fight back and just tried to move out of their way. Disappointed at them the Iniative members only stopped fighting her when Prodigy ordered them to. The Designate told the crowd that she had become what she had been destined to be and that despite the compassion of one of them (Cloud 9), which restored her and renewed her path, the others acted numb, dumb, petty and cruel by succumbing to fear. She deemed humanity unworthy. She saw the hurt insie Ultragirl, Cloud 9 and Komodo, who felt they had lost a friend and then saved Firestar, Gravity, Telemetry and Firestar from their underground prison to ease their sense of loss. The Designate then left Earth for outer space to seek...(whatever she is seeking). Comments: Adapted by Dan Jurgens, John Romita, Jr. and Klaus Janson. Originally, this was going to be a profile for Thor Girl in the Guide to the Mythological Universe website, but then: 1) I didn't want to open a window for characters with tenuous links to gods and goddesses on that site, and 2), my chance for a photo-shop edited picture of Kristy Swanson as Thor Girl equal to my Carmen Electra/Valkyrie photo fell through. After the death of Odin, Thor moves Asgard to Earth that he can still better protect it. Thor Girl serves as one of his emissaries carrying out his bidding. Along this timeline, Thor eventually takes over the Earth after the destruction of Asgard results in the devastation of New York City and Thor girl is possibly behind the scenes during that storyline. However, Thor's future self alters the timeline and removes Asgard from Earth. Thor Girl, however, continues to serve as a protector of Earth even in the wake of the destruction of Asgard and the seeming deaths of the Asgardians. It is unsure as to who created the bank-pilfering probes in Thor II#46. Several Marvel characters would be capable of creating them, including the Mad Thinker, Alastair Smythe, Artur Zarrko (The Tomorrow Man), the Tinkerer and Machinesmith. Is it just me or is Thor Girl perhaps "the most fun" and dynamic new character to come out of Marvel in a while? I could see her as a member of the New Warriors or "Great Lakes Avengers." Thor Girl also has an entry in the Official Handbook of the Marvel Universe: Women of Marvel 2005 and the Civil War: Battle Damage Report. 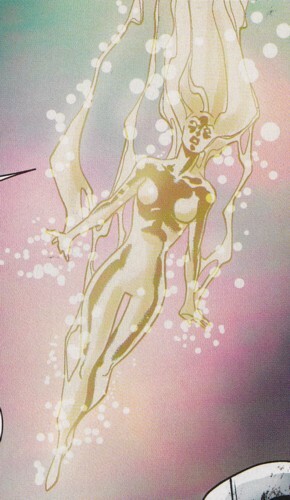 The Spirit of the Jewel She was Earth-3515's future counterpart of Tarene. Traveling back in time, she equipped Desak with the power to slay gods in their native realms, possibly as a means to try and prevent the Reigning from occurring. When the timeline resulted in Thor taking over the earth, she revealed her identity to Thor who traveled back in time and prevented that timeline from occurring. With her power to move through time, she probably still exists.